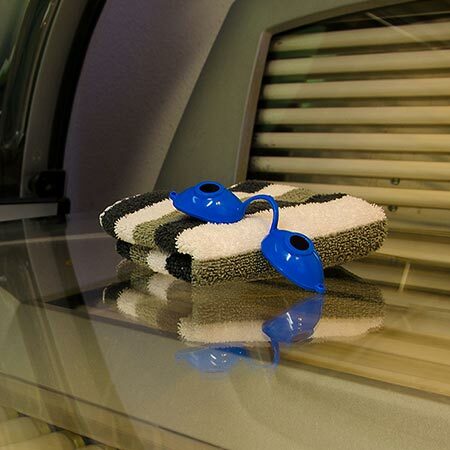 The Joint Canadian Tanning Association (JCTA) wants to let the Canadian public know there is a difference between professional indoor tanning facilities and self-serve and home tanning equipment. It’s not the equipment, it’s the person controlling the equipment that is the problem. Almost anything we experience in life can be dangerous if used improperly, and indoor tanning is no exception. That’s why JCTA professional indoor tanning facilities promote a balanced message about indoor tanning, educate their patrons about the potential risks of UV overexposure, and enforce strict safety standards to ensure positive and a controlled client experience. One pillar of the total skin care education and advice that professional salons offer is discouraging the unsupervised use of home tanning equipment and self-serve equipment (coin-op, swipe card or client controlled), because it increases the chances of misuse of the equipment and sunburn or overexposure. The difference between using an unmonitored sunbed at home or self-serve and a sunbed controlled by a trained and industry certified operator at a professional salon is apparent from the World Health Organization’s data on sunbed exposure and malignant melanoma. While the research is purported to show a 75 percent increase in melanoma risk from use of sunbeds before the age of 35, JunkScience.com critiqued that study, citing University of Delaware epidemiologist’s Dr Mia Papas’s reanalysis of the data. Dr. Papas concluded that “when professional sunbed usage is considered independent of home and medical exposures there is no association with melanoma.” In contrast, use of an unmonitored sunbed at home was shown to increase melanoma risk by 40 percent and the JCTA believes this to be the same for self-serve equipment. So what does this mean? According to Joint Canadian Tanning Association Executive Director Steve Gilroy, it shows that, like nearly everything else in life, tanning safely is about moderation and doing it the right way. “Looking at the data, it is clear that tanning equipment itself is not the problem – it’s the person controlling it. Without a trained and industry certified employee at the helm, you welcome misuse that can lead to skin damage. It’s not a good idea to get your tan without going through the recommended exposure schedule required to do it responsibly,” said Gilroy. Professional indoor tanning salons believe in teaching moderation and sunburn prevention to minimize the risks associated with UV exposure. Getting you a beautiful tan starts with educated skin care technicians evaluating your skin type, setting a moderate exposure schedule, issuing protective eyewear and implementing other safety screening techniques. Tanning is not a one-size-fits all. Getting a beautiful UV tan means something different for everyone. That’s because the amount of UV exposure needed to acquire a tan is different for a fair-skinned person than it would be for a central European with an olive complexion. Trained operators’ control all tanning exposure times, minimizing a client’s risk of overexposure and sunburn, and require tanners to use Health Canada-compliant protective eyewear, which eliminates the risk of eye injury. All clients undergo comprehensive evaluations, including identifying their sun sensitivity (skin type). Clients also are taught about photosensitizing medications, which can potentially make a person more susceptible to sunburn. Clients are taught sunburn prevention and the appropriate use of outdoor chemical sunscreens. This education, combined with the fact that a tan is nature’s protection against sunburn, is why indoor tanning clients are up to 81 percent less likely to sunburn outdoors as compared to non-tanners, according to surveys. Clients are presented with material outlining the potential risks of overexposure to UV light and sign informed consent agreements acknowledging this. Find a JCTA salon near you.